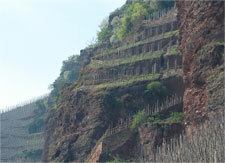 German vineyards are some of the most labour intensive in the world. Steep-sided valleys are packed row upon row with vineyards, producing some of the most aromatic white wines with a wonderful ability to age. With the highest proportion of Riesling grown here compared to anywhere else, German wines produce some of the finest examples of this grape; from bone-dry and steely Kabinetts to unctuous, sweet TBAs and everything in between. German producers have unquestionably shown who is boss of this varietal. With so many great wines to choose from, we hand pick only the finest, with world class producers like Dönnhoff regularly making an appearance. Older vintages are a rarity, but we do manage to get our hands on some from time to time, so do make sure you check back regularly.